The grill cleaning and restoration experts at the BBQ Cleaning Guru are ready to serve you. No one offers the experience we do when it comes to barbecue cleaning, grill repair, BBQ restoration and do-it-yourself BBQ cleaner sales. We always incorporate top-of-the-line grill parts to go with our years of experience in this line of work. We clean, service and restore grills from all of the leading manufacturers including Dacor, DCS, Fire Magic, Lynx Viking, Wolf, TEC Sterling and more, and are committed to keeping your grill cleaner than ever and performing its best. 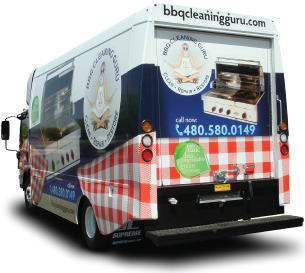 Count on the BBQ Cleaning Guru for all your barbeque cleaning needs. Did you know that we are the pioneers of “BUILT-IN” barbeque restoration? No other company picks up your barbeque grill and cleans, repairs, restores and returns it looking and performing like new within the same week. You’ll never miss a weekend barbeque! Don’t trust your luxury grill to an on-site scrape and go service. Your grill deserves better! Check out our Photo Gallery of before and after grill restorations. We guarantee you will see your grill model and be amazed at the transformation!